Ryegrass producers who will be grazing cattle on it need to be aware of the complication of Grass Tetany. It is a nutritional condition caused by low levels of magnesium in the blood. It is common in older cows that have just given birth but can affect younger cattle as well. It is usually seen in the spring but can show up in the fall when livestock graze young and succulent cool season grasses. It intensifies in warm periods, usually 5 to 10 days after cool, wet, cloudy conditions when lush green starts growing rapidly. When night temps stay above 55 degrees F, the incidence of Grass Tetany falls because grasses are able to draw up more magnesium from the soil. Symptoms of Grass Tetany are nervousness, muscle twitches, staggering, and convulsions, followed by death. To prevent Grass Tetany, do not start grazing until grasses have reached 6-8 inches in height. Dry cows, heifers, and stocker cattle are less susceptible than cows in heavy lactation. Also adding legumes to the pasture will help prevent it as they have high magnesium levels. An easy way to avoid it is to supplement cattle with a mineral high in magnesium. 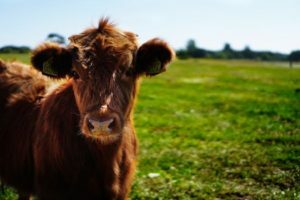 Treatment for cattle with Grass Tetany is an IV solution of Calcium gluconate fortified with magnesium and P and should be administered by a large animal vet. Cattle should be removed immediately from pastures and allowed access to hay and dry pastures. For more information regarding Grass Tetany, please contact C.L. Sumner at the N.C. Cooperative Extension, Martin County Center at 252-789-4370.